Who decided that letdowns are romantic? Whoever it was is probably owed billions in royalties from weepy singer-songwriters who’ve built entire careers around the premise. Conor Oberst, we’re looking in your direction. 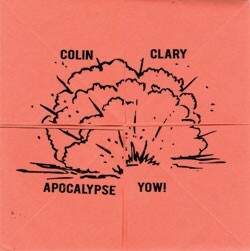 In any event, the question is a good one, posed and to some degree answered by Burlington’s indie-pop prince, Colin Clary, on his latest solo album, Apocalypse Yow! Still not convinced? Clary’s last effort came wrapped in a miniature sweater. Clary’s music is equally idiosyncratic. From the album’s opener, “Me Loves You,” to its capricious closing track, a cover of the late Ritchie Valens’ hit single “Donna,” Apocalypse Yow! is loaded with 17 nearly perfect little pop ditties that would likely turn even the most staunch frown upside... well, you know. As a solo artist, Clary tones down the twee to some degree. Unlike his über-chipper work with indie-pop sensations The Smittens — which sometimes sounds like the musical equivalent of being sucker-punched by a member of The Lollipop Guild — the former Madelines front man shows a (slightly) darker side, particularly with regard to his arrangements. Clary wrote and performed all of the music here himself — aside from “Donna,” of course — and proves adept at crafting subtly dynamic pop tunes with a variety of acoustic and electronic instruments and sounds. At times reminiscent of indie-pop godfathers Belle and Sebastian or perhaps Mojave 3 — especially on tracks such as “Unattainable” and “Action Figure”— Clary pulls off a remarkable feat: happy melancholia. Who decided that letdowns are romantic? Who cares? Yow! Colin Clary is one of Burlington’s most treasured and prolific musicians. Like any true artist, he manages to improve with each step he takes, and Apocalypse Yow! is no exception. Catch him with his other band, The Smittens, this Friday at Parima’s Main Stage with local jazzy guys, The Jazz Guys.